Windows and doors are the biggest source of energy loss in your home. Accounting for up to half of your lost heating and cooling, new windows can save you up to 7%-15% on your monthly heating and cooling bills. When replacing your windows, the exterior material you choose will directly effect the energy efficiency of your home. Several materials are used in windows construction. The most common materials include wood, clad wood, aluminum, fiberglass, and vinyl. Vinyl windows are much improved from past offerings. They are usually made of polyvinyl chloride (PVC) which has good insulating values. Initially energy efficient, depending upon outside temperature extremes, the PVC will separate from the glass due to their different properties of expansion and contraction. They can also fade and crack over time, degrading significantly in as little as five years. Aluminum windows are more durable, but rank lower on the energy efficiency scale than wood or clad wood. Metal is a poor insulator and conducts heat rapidly. Cheaper aluminum windows often don’t have a long lasting exterior finishes. Fiberglass windows have thermal efficiency greater than vinyl or aluminum. They are very durable and available in a wide variety of styles and sizes. And their finish resists fading, chalking, and cracking. 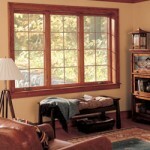 Wood windows are long-lasting and energy efficient. You can paint or stain them any way you like. Although beautiful and a natural insulator, the exterior of wood windows require regular, consistent maintenance. Clad Wood windows offer the energy efficiency of wood with a low maintenance exterior. The frame is natural wood with an aluminum or vinyl cover, or cladding, that is snugly wrapped around the exterior of the wood. If you consider clad wood windows, the thickness of the aluminum cladding is important. Marvin Windows and Doors builds their windows with extruded aluminum that is the thickness of a quarter. Most manufacturers use roll form aluminum that is the thickness of a soda can. When it comes to buying replacement windows, it can be an overwhelming project to begin, especially if you haven’t been educated on your options. Rest assured, these few lessons will prepare any window rookie to make informed decisions about this important investment. There are several different styles, features and functions of windows. Double-Hung Windows have two sashes, one that you can raise and one that you can lower. 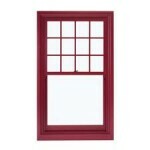 You can also get double hung windows that tilt in for easy cleaning. 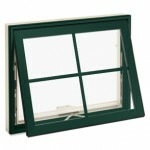 Casement Windows typically have a crank at the bottom of the window to open the sashes outward. 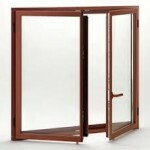 Also available are push-out casements with a locking lever handle as pictured here. Both have features for easy cleaning. Awning windows are hinged at the top with hardware at the bottom, allowing for air flow even during a light rain. Round-Top Windows have an arch at the top giving a unique and aesthetically pleasing look to your home.